Supporters of Deferred Action for Childhood Arrivals program (DACA), demonstrate on Pennsylvania Avenue in front of the White House in Washington, Sept. 3, 2017. The White House is expected to announce a decision about Deferred Action for Childhood Arrivals on Tuesday, with early media reports indicating the president will end the program that has shielded hundreds of thousands of young undocumented immigrants from deportation for the last five years. Officials who described the move to journalists said it would come with a six-month delay meant to give Congress time to address the issue. Lawmakers were not involved in instituting the program, which was created through an executive order by former President Barack Obama. A protest is planned Tuesday morning in front of the White House in support of DACA and its recipients — some 800,000 people across the country, brought to the United States as children. Demonstrations are also expected in other cities across the United States. President Donald Trump came into office with a promise to eliminate DACA, but at times seems to ease up on that rhetoric; since his inauguration, however, the president has prioritized bolstering the country's deportation system, calling for thousands more immigration and border agents to be hired. "DACA is not legislation, it's executive action and the president could rightfully abandon it altogether or piece by piece," said David Abraham, professor of immigration and citizenship law at the University of Miami School of Law. Unclear Monday was what would happen if Congress did not take any action before the six-month window ended, or what happens to someone whose work permit comes up for renewal during that period. FILE - House Speaker Paul Ryan speaks during his visit to Intel in Hillsboro, Oregon, Aug. 23, 2017. 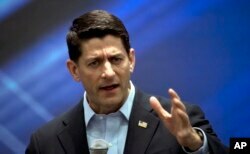 House Speaker Paul Ryan and several other Republican lawmakers are urging the president not to cancel the program. Ryan says he believes Congress should come up with a way of protecting people now in the DACA program. House Democratic Leader Nancy Pelosi has asked Ryan to work with Democrats this week to find a legislative solution for the people sometimes referred to as "Dreamers." 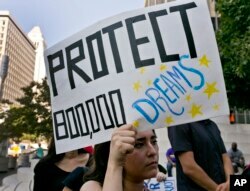 There are DACA supporters on both sides of the political aisle in the U.S., but key members of Trump's inner circle — including Attorney General Jeff Sessions — and many Republican members of Congress are vocal opponents who have criticized the program's creation as executive overreach. The Obama administration began the program in 2012 to allow young undocumented immigrants who met the requirements to lawfully remain in the country to work and study, in a semi-legal status that has to be renewed every two years. It does not provide a path to citizenship, however. The majority of DACA-eligible people are from Mexico, followed by Guatemala, El Salvador, South Korea, Honduras and China. Supporters of the program argue that since applicants came as children, they often have little connection to their home country, and have grown up in the U.S., where they have family and friends, work and school — years of building a life. The average age that DACA recipients arrived to the U.S. was 6.5 years old, according to data collected by Tom K. Wong, associate professor of political science at the University of California, San Diego. FILE - An unidentified student joins a rally in support of the Deferred Action for Childhood Arrivals, or DACA program, outside the Edward Roybal Federal Building in downtown Los Angeles, Sept. 1, 2017. The program requires applicants to have lived continuously in the United States since 2007, were under the age of 16 when they arrived, and under the age of 31 as of 2012. There are also education and security requirements — they cannot have a significant criminal record and must be enrolled in school, or have graduated from high school in the United States, or have a GED, or have been honorably discharged from the U.S. military. An estimated 800,000 of the 1.7 million people eligible for DACA have registered. Some who would have met the requirements feared handing over such personal information to the government, including details about close relatives who may also be in the U.S. illegally. "They provided the government with all personal information about themselves, including of course their residences, all of which information could be used now to find and deport them if the government so choose chooses," Abraham said. When announcing the program in 2012, Obama emphasized that it was not a permanent solution. "This is a temporary stopgap measure that lets us focus our resources wisely while giving a degree of relief and hope to talented, driven, patriotic young people," he said at a news conference on June 15, 2012. Congress has not passed any law since that would replace DACA, and lawmakers have struggled for years to push immigration reform through. For years, younger members of the undocumented community and their supporters have cultivated a grass-roots movement to push for immigration reform that would formalize their legal status. Cesar Vargas, codirector of the DREAM Action Coalition, said at a rally in New York last week that he and other activists will keep fighting to stay in the country. "We're not just taking the fights in courts, and state capitals, or Congress, but we are taking the fights here in our street, where our community is, where the immigrant families live, and we are going to show that we are not afraid, that whatever happens with DACA, we are going to continue to demonstrate that we are standing for our families," said Vargas, who came to the United States when he was 5 years old. "We are going to continue to go to school, we are going to continue to really contribute to the country that we call home." VOA News Center reporter Bill Gallo, associate producer Elizabeth Cherneff, and writer Chris Hannas contributed from Washington; News Center reporter Ramon Taylor contributed from New York.